This page has been viewed 34 times this month, and 2391 times total. Cartoon Characters: Roy Knable (Mouse), Helen Knable (Mouse), RoboCat. Characters (Live Action): Roy Knable, Helen Knable, Spike, Darryl Knable, Diane Knable, Murray Seidenbaum, Sarah Seidenbaum, Crowley, Pierce, Wetzel, Sackler, Ducker, Another Buyer, Skeletal Worker, Newscaster, Guy Squirly, Game Show Announcer, Duane's Underworld - Ring Announcer, Duane's Underworld - Mr. Gorgon, Duane's Underworld - Mrs. Gorgon, Duane's Underworld - Wrestling Referee, Cyndi, Velma, Guido, Handsome Guard, Heavy Set Guard, Innkeeper, Peasant, Another Peasant, Executioner, Joey, Nobleman, Miss Daisy, Instructor, Duane, Garf, Anchor Woman, Android, Frankensteinfeld, Butler, Max Hell Man, Cop, Crying Widow, 30 Something to Life Announcer, Girlfriends, Dancers. Vocal Talent: John Ritter (Mouse), Pam Dawber (Mouse). 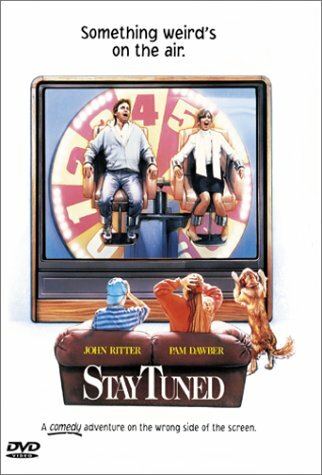 Vocal Talent (Live Action): John Ritter (Roy Knable), Pam Dawber (Helen Knable), Jeffrey Jones (Spike), David Tom (Darryl Knable/Narrator), Heather McComb (Diane Knable), Bob Dishy (Murray Seidenbaum), Joyce Gordon (Sarah Seidenbaum), Eugene Levy (Crowley), Erik King (Pierce), Don Calfa (Wetzel), John B. Destry (as John Blackwell Destrey) (Sackler), Susan Blommaert (Ducker), Maurice Verkaar (Another Buyer), Ken Douglas (Skeletal Worker), Gerry Nairn (Newscaster), Dale Wilson (Guy Squirly), Don Pardo (Game Show Announcer), Lou Albano (Duane's Underworld - Ring Announcer), George Gray (Duane's Underworld - Mr. Gorgon), Faith Minton (Duane's Underworld - Mrs. Gorgon), Alan C. Peterson (Duane's Underworld - Wrestling Referee), Marlowe Dawn (Cyndi), Laura Harris (Girlfriend #1), Andrea Nemeth (Girlfriend #2), Tiffany Michas (Girlfriend #3), Kristen Cloke (as Kristin Cloke) (Velma), Gianni Russo (Guido), Bill Croft (Torpedo #1), John "Bear" Curtis (Torpedo #2), Victor A. Young (Handsome Guard), Jonathon Pallone (Heavy Set Guard), Ken Kramer (Innkeeper), Dave "Squatch" Ward (Peasant), David Longworth (Another Peasant), Gordon Masten (Executioner), Marie O'Connor (Joey), Michael Puttonen (Nobleman), Janet Craig (Miss Daisy), Kim Restell (as Kimberley Restell) (Instructor), Michael Patrick Hogan (as Michael Hogan) (Duane), Jimi Defilippis (as Jimi Deflippis) (Garf), Colleen Winton (Anchor Woman), Allen Schneider (Android), Gene Davis (as Eugene Davis) (Frankensteinfeld), Peter Haworth (Old Man #1), Des Smiley (Old Man #2), George Boshchuck (Butler), Terry Lewis (Max Hell Man), Jerry Wasserman (Cop), Rebecca Toolan (Crying Widow), Ernie Anderson (30 Something to Life - Announcer [Voice] [uncredited]), Shane Meier (Yogi Beer), Serge Houde (Yogi Beer), Julie Bond (Yogi Beer), P. Lynn Johnson (Silencer of the Lambs), Boyd Norman (Silencer of the Lambs), John Kirk Connell (Silencer of the Lambs), Samantha McKenna (Silencer of the Lambs), Steve Adams (30 Something to Life), John Pyper-Ferguson (as John Pyper Ferguson) (30 Something to Life), Kevin McNulty (30 Something to Life), Joe Norman Shaw (30 Something to Life), Todd Duckworth (3 Men and Rosemary's Baby), Robert Wisden (3 Men and Rosemary's Baby), Peter Yunker (3 Men and Rosemary's Baby), Roselyn Royce (Three's Company Spoof), June Nagy (Three's Company Spoof), Sandra "Pepa" Denton (as Salt-N-Pepa) (Start Me Up), Cheryl "Salt" James (as Salt-N-Pepa) (Start Me Up), Deidre "Spinderella" Roper (as Salt-N-Pepa) (Start Me Up), Herbie Azor (Dancer), Steve Azor (Dancer), Fatima Robinson (Dancer), Freda Estavillo (Dancer), Jossie Thacker (as Jossie Harris) (Dancer), Indrani DeSouza (Dancer), Latisha Oliver (Dancer), Tracy Horbachuk (Dancer), Robert Vinson (Dancer), Lisa Stevens (Dancer), Mike Grey (Dancer), Marlowe Windsor (Dancer), Free Crawford (Dancer), Grant Vandyke (Dancer), David Avelar (Dancer), Dolan Jose (Dancer), Dani Melendez (Dancer), Ema Husai (Dancer), Boogie O'Banion (as Boogie [Laura] O'Banion) (Dancer), Brad Rapier (Dancer), James "Jazzy" Everett (ancer), Andrea Kelly Konno (Dancer). Produced By James G. Robinson. Animation Producers: Linda Jones Clough, Steven Paul Leiva. Executive Producers: Gary Barber, David Nicksay. Animated By Ken Bruce, Mark Fisher, Brad Forbush, Lee McCaulla, Susan M. Zytka. Written By Tom S. Parker, Jim Jennewein. Story: Tom S. Parker, Jim Jennewein, Richard Siegel. Edited By Peter E. Berger. Extras Casting Assistant: Louise Mackiewicz. Art Directors: Richard Hudolin, David Willson. Assistant Art Director: Sheila Haley. Art Department Draftsman: Doug Byggdin. Art Department Assistant: Bridget McGuire. Animators: Ken Bruce, Mark Fisher, Brad Forbush, Lee McCaulla, Susan M. Zytka. Assistant Animators: Bronwen Barry, Travis T. Cowsill. Animation Co-Supervisor: Jeffrey M. DeGrandis. Animation Checkers: Charlotte Clark, Karen Hansen. Animation Production Coordinator: Melissa Kurtz. Animation Art Director: Guy Vasilovich. Storyboard Artist: Jeffrey M. DeGrandis. Ink and Paint Supervisor: Jungja Wolf. Assistant Ink and Paint Supervisor: Carmen Brooks. Ink Artists: Shigeko Doyle, Maria Gonzalez. Paint Lab Supervisor: Deborah Rykoff-Bennett. Designer (Mice Characters): Chuck Jones . Animation Production Manager: Richard Sullivan. Assistant Animation Production Manager: Roxy Steven. Head Painters: Elizabeth Solyom, Ken Wells. Property Masters: Jimmy Chow, Andreas Nieman. Assistant Property Masters: Catherine Leighton, Paul Mulder. Prop Buyers: Dominique Fauquet-Lemaitre, D.N. Pettipas . Set Dressers: Patrick Kearns, Brad Mulder, Chuck Robinson. Set Buyers: Pam Hallas, Helen Jarvis, Joanne Quirk. Construction Coordinators: Doug Hardwick, Mike Rennison. Set Decoration: Daniel Bradette, Annmarie Corbett, Lin Macdonald, Rose Marie McSherry. Costume Design: Joe I. Tompkins. Assistant Costume Designers: Kathy Monderine, Jori Woodman. Costume Supervisors: Debbie Douglas, Debbie Geaghan. Head Makeup Artist: Lee Harman. Special Makeup Designers: Alec Gillis, Tom Woodruff Jr.
Special Makeup Effects Artists: Barney Burman, Jake Garber . Head Hair Stylist: Sugar-Ginger Blymyer. First Assistant Director: Jack Sanders. Second Assistant Director: Rachel Leiterman. Third Assistant Director: Adam Druxman. Assistant Director Trainees: Sheila Carpenter, Robert Crippen. Second Assistant Director, Tucson: Charles Miller. Second Assistant Director, Second Unit: Robert Lee. Director of Photography: Peter Hyams. First Assistant Camera: Alan Disler. Second Assistant Camera: Simon Barry. Still Photographers: Bob Akester, Rob McEwen. Best Boys: John Adshead, Barry Donlevy. Key Grips: Ron Gillham, Nick Kuchera. Rigging Gaffers: Dale Garrison, Don Saari. Video Assist Operator, 24 Frame Coordinator: Klaus Melchior. Main Title Sequence Photography: West Indigo Inc.
Special Effects Coordinators: George Erschbamer, John Thomas. Special Effects Foreman: Don Leask. Special Effects Fabricator: Dan Cervin. Special Effects First Assistants: Dean Lockwood, Tim Storvick. Special Effects Second Assistant: Joel Whist. Special Effects Assistant: Corbin Fox. Visual Effects Producer: Liz Ralston-Bugge. Visual Effects Coordinator: Ladd McPartland. Visual Effects Supervisor: John Nelson. Visual Effects Art Directors: Clark Anderson, Michael Gibson. Director of Visual Effects Photography: Mark Vargo. Visual Effects: Scott E. Anderson, Rhythm and Hues. Computer Graphics Team Supervisors: Daniele Colajacomo, David Weinberg, Kathy White. Supervising Effects Animator: David Bossert. Unit Production Manager: Michael Macdonald. Editor, Animation Sequence: Philip Malamuth. Assistant Editors: John Coniglio, Peter Fandetti. Assistant Editor, Canada: Michael Smith. Orchestrators: Bruce Broughton, Don Nemitz. Music Editors: Jeff Carson, Jim Harrison, George A. Martin. Supervising Sound Editors: Scott Martin Gershin, Wylie Stateman. Sound Editors: Willy Allen, David Baldwin, Robert Bathas, Tony Currie, Mark Lanza, Steve Mann, John Miceli, Scott Mosteller, Jay Richardson, Peter Sullivan. Sound Designer, Animation Sequenc): George Daugherty. Sound Mixers: Ralph Parker, Daryl Powell. Sound Re-Recording: Buena Vista Sound. Sound Re-Recording Mixers: Dave Campbell, John Reitz, Gregg Rudloff. Sound Effects Editors: Christopher Assells, Glenn T. Morgan. Foley Artists: Kevin Bartnof, John Roesch. Dialogue Editors: Chris Hogan, Randy Kelley, Dan M. Rich. Boom Operator: Donald D. Brown. Stunt Coordinator, Second Unit: Ken Kirzinger. Stunt Players: Lou Bollo, Yves Cameron, Jim Clark Jr., Gilbert B. Combs, Peter Cox, Dorothy Fehr, Alex Green, George Josef, Michael Langlois, J.J. Makaro, Mike Mitchell, Scott Nicholson, Fred Perron, Fiona Roeske, Bill Stewart, Dawn Stofer-Rupp, Melissa R. Stubbs, Keith Wardlow, Jennifer Watson-Johnston, Brent Woolsey. Stunt Driver, Cart: Tom Glass. Transportation Co-Captains: Mark [Blue] Angus, Robert Sinclair. Drivers: Lawrence Albright, Dave Miller. Assistant Location Manager: Kendrie Cutler. Location Manager, Tucson: Charles Miller. Location Assistant, Tucson: John Douglas Ayers. Wolf Pack: Doug Seus' Wasatch Rocky Mountain Wildlife. Wolf Trainers: John Beers, Susan Grants, Doug Seus, Lynne Seus, Scott J. Smith, Clint Youngreen. Animal Trainers: Dawn Martin, Mark Wiener. Special Publicity Consultant: Ronni Chasen. Production Assistants: Adam Cook, Peter Skyes. Script Supervisors: Lara Fox, Pattie Robertson. Assistant, Mr. Hyams, Vancouver: Janice Golden. Assistant, Mr. Hyams, Los Angeles: Toni Wilkes. Assistant, Mr. Barber: Brenda Johns. Assistant, Mr. Ritter: Chad O'Connor. Assistant, Mr. Robinson: Janet M. West. Stand-In, John Ritter: David Richard Lewis. Crew, Video Image: Rhonda C. Gunner, David Hofflich, Richard E. Hollander, Pete Martinez, Gregory L. McMurry, Monte Swann, John C. Wash.
Post- Production Accountant: David Mastron. Assistant Accountants: Florence Holihan, Beverly Wiens. Production Comptroller: Todd P. Smith. Production Coordinators: Catherine Howard, Mandy Spencer-Phillips. Production Coordinator, Los Angeles: Louise Rosner. Production Coordinator Trainee: Lara Melville. Fencing Double, Roy: Philip Romano. Fencing Double, Spike: George Marshall Ruge. Administrator, Morgan Creek: Richard J. Kupfer. Helicopter Pilot, Tucson: Rick Shuster. Production Associate, Mr. Schmidt: Carlos H. Sánchez. Negative Cutting: Precision Film Cutting. Locomotive, Tucson By: Short Line Enterprises. Acknowledgement: Union of B.C. Performers. 24-Frame Video Displays: Video Image. Sincere Appreciation To: I.A.T.S.E. Local 891. Main Title Sequence Design: Saxon/Ross Film Design. Additional Opticals and Titles: Pacific Title. Completion Guaranty Provided By: Completion Bond Company. The Producers Would Like to Thank: Albert G. Ruben and Company, B.C. Film Commission, The Bridge Studios, The City of Vancouver, Credit Lyonnais Bank (Nederland) N.V., Hair Club for Men, NBA Properties Inc., Proton Corporation, Tektronics, Televector Disc, The Catalyst Group, United States Fencing Corporation, William F. White International. Do you have anything to add to this page? Have we made any mistakes... or do you have any additional information about Stay Tuned? If so, we would love to hear from you. Please send us a quick note with your additions or corrections to this page, and we will make the corrections as soon as possible! Something weird's on the air. Most people would love to get into television... Helen and Roy Knable have 24 hours to get out of it.... literally! Do you love Stay Tuned, or do you think it is the worst cartoon ever? Let us know what you think! Surely you have an opinion... so share what you think. Take a minute and post your own comments about this cartoon here. Stay Tuned by Big Cartoon DataBase is licensed under a Creative Commons Attribution-NonCommercial-ShareAlike 4.0 International License.